I miss the 4th of July. In NYC. The 4 day weekend. The empty streets. The ease of getting a table at a cafe. The amazing fireworks display put on by Macy's. Just writing this reminds me of every July 4th evening since the year I moved into my old apartment building in Astoria. The roof had a perfect view of the fireworks. Every July 4th, around 9pm, Ruy and I, as well as most of our neighbors in the building (Marcia, Agnieszka, Diego, Eloah, Raquel, and others) and, at time, our BFF Joanie, would gather on the roof of the building to watch the Macy's fireworks. It's not as if they were exploding over our heads but we had a great view without the crowds. And it was just such a Queens thing to do on that night. Funny thing is, Brasil is playing today in the World Cup and if they win, there will be plenty of fireworks in the sky here also. Okay, this is Brasil, there will be plenty of fireworks in the sky whether they win or not. But, I still miss New York City, and all my old peeps from the building on 48th St.!! So, to all my friends and family back home in America - Happy Fourth of July!! Happy Independence Day!! Enjoy your BBQs and beach time. Below is the step by step for the card. Also, stop by the StencilGirl blog today to check out another cool card that I made for the summer - just click HERE! 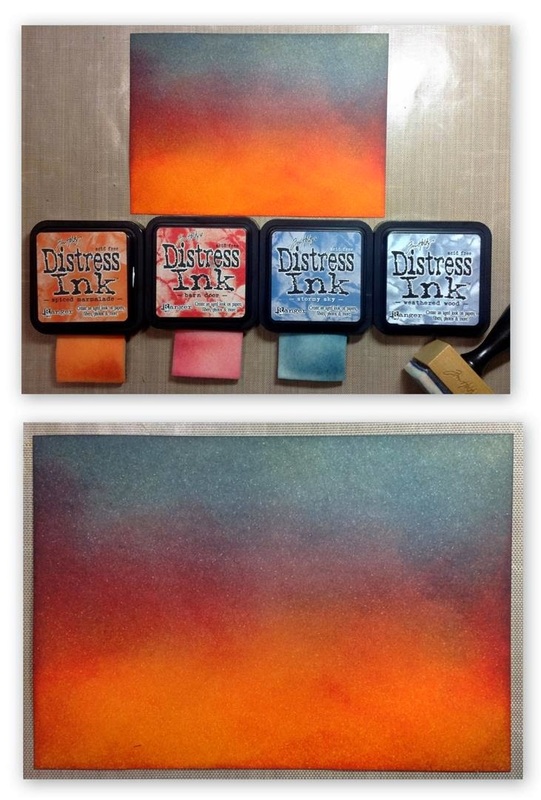 Step 1 - Make the background by blending Ranger Distress Inks in Spiced Marmalade, Barn Door, Stormy Sky, and Weathered Wood with an Ink Blending Tool and 4 pieces of the blending foams. I started with the Spiced Marmalade and worked my way up to the Weathered Wood blending as well as I could. Instead of me doing a step by step for this, check out this great VIDEO by Anya Schrier that shows you how its done and what I used for inspiration and guidance. Below is how my background came out. 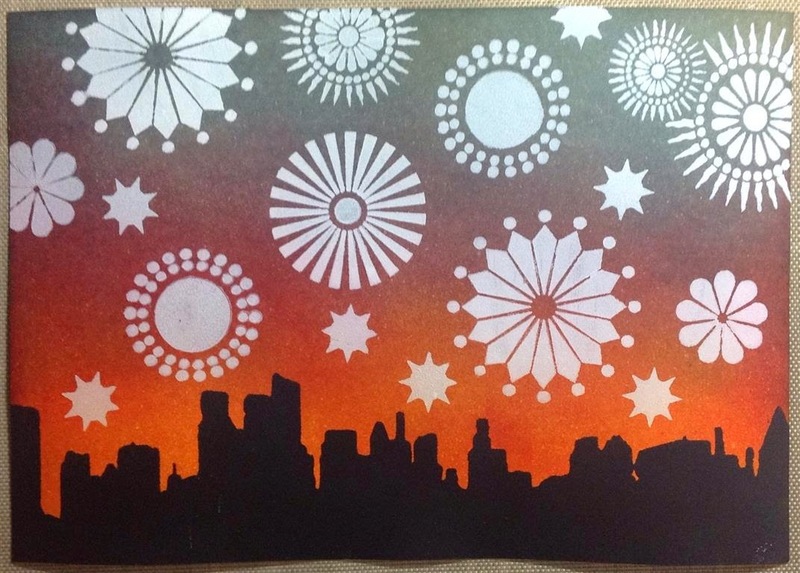 Step 2 - Lay the City Scape Stencil over the blended cardstock so that the bottom outline of the city sits so you can see your colors underneath. You will be covering this area with black paint. Secure the stencil with removable tape (optional). Using a makeup sponge (or applicator of your choice), adhere the black paint so that it covers the whole bottom of the blended cardstock. You might have to do two coats. Heat set between coats if necessary. When dry and very black, remove stencil. Your piece should look like the bottom photo below. 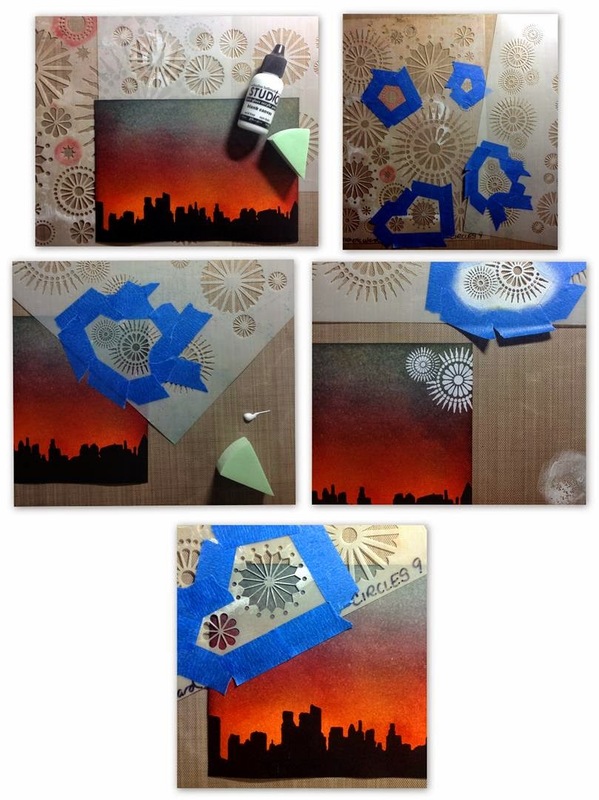 Step 3 - For the "fireworks", I used parts of two different stencils - Circle 9 and Border Circles, both by Michelle Ward. Using painters tape, I masked off the parts of the stencils I wanted to use for fireworks. Starting in the upper right corner, I placed the design where I wanted it, squirted a bit of the white paint on my craft mat, and dabbed it through the stencil using a makeup sponge. Remove the stencil. Heat set. Move to the next section. Do the same until you get the design you like. Some hints - work slowly. Use very little paint on the makeup sponge. You can add more, but you cannot remove it once it is down on the paper. Lift the stencil carefully and make sure that what you just painted is dry BEFORE you lay the stencil down for the next section. This is how my piece turned out after all the parts were applied with the paint. Step 4 - Layered my card on a light blue glimmer paper and then again on a grayish paper. As much as I wanted to do red, white, and blue, it was not going to work for this card. Then I added some Bling and Crystal , True Blue, Lavender, Orange Peel, Firefly, and Yellow Stickles - hey, these are fireworks!! There needs to be color in the dark sky! The inside says "Happy 4th of July"! Well, hope you liked this easy card. Supplies used are below. Happy 4th of July everyone (in America). 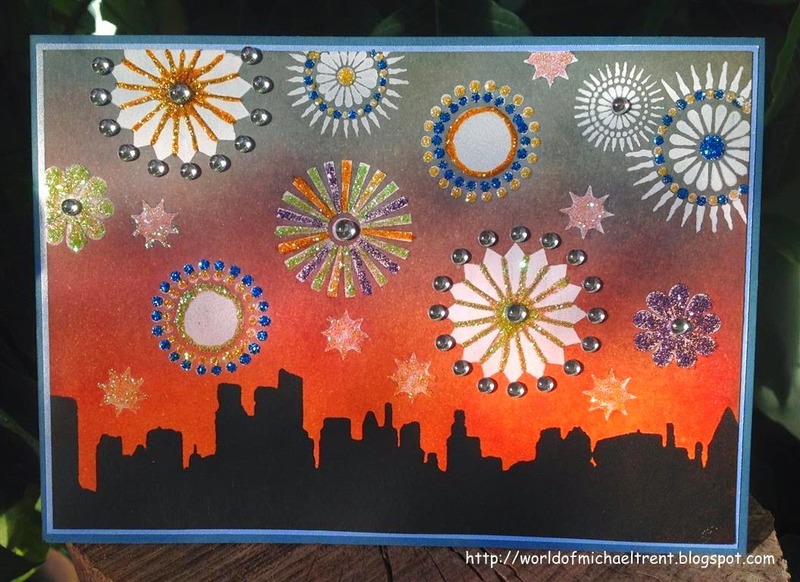 Don't forget to stop by the StencilGirl blog today to check out another cool card that I made - just click HERE!